The last couple of days I’ve been learning how to sew from my grandma. It’s been so much fun! I learned how to sew up a hole and how to hem. We also went to Wal-Mart and got instructions on how to make a dress and a handbag. I got baby-blue fabric for the dress and a polka dot pattern for the bag. When we got home we started working on the dress. It was kind of hard to make the pleats. We finished the dress part and were about to work on the sleeves when the sewing machine broke! So, we are going to have to get another one. Today I’ve just been fixing some of my clothes by hand. Sewing is really fun and cheaper if you want a dress. It will cost us only about $8.00 in total to make the dress. If you just buy it already made it would cost probably about $20.00 to $60.00 or even more than that depending on the dress. This is a good way to save money especially if you’re a shopaholic like me. It’s also a good thing to sew instead of buying a dress because we’re all in economic trouble. I think it’s good for me to learn how to sew now so when I grow up and have children I can make clothes for them. Some people think it’s boring and a lot of people seem to be not doing it anymore, but I don’t think it’s boring! I plan to continue sewing because its fun and I love it! I’ve known guys who knit. They claim it’s relaxing and creative, all at the same time. I might be able to knit, I guess, but probably not. I know I wouldn’t sew…I’d end up with ruined fabric and lots of holes in my fingers! treasure your time with your grandmother. one of mine taught me to cook and many other useful things about life. she sounds like a great woman. It might interest you to know that Rosey Greer, a defensive end (one of the “Fearsome Foursome”) that played for the LA Rams did cross stitch/needle point. He did say that it relaxed him. 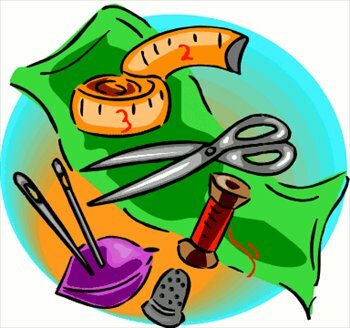 When I was growing up, any boy who took up sewing or knitting was in for a pretty rough time. Of course, I guess if you were as big and tough as Rosey Grier, you could get away with it.